Join barleymash for its San Diego Derby Party on May 3 from 11am until 4pm. Check out the live bluegrass band during brunch as barleymash rolls out the turf at this paddock-sized party surrounding the Kentucky Derby. This special event will feature a suit and hat contest, raffle prize giveaways and Derby Day specials on food and drinks. Enjoy the barleymash spin on Derby favorites like the Hot Brown Flat Bread, topped with roasted turkey, garlic cream, bourbon-roasted tomatoes, caramelized onions, apple wood smoked bacon, pepper-jack and avocado. Try the specialty mint julep made with Woodford Reserve and keep the cup as a souvenir. Chef Kevin is also preparing a Barley Burgoo Stew, with pulled pork, braised chicken, braised short rib, black-eyed peas, okra, roasted veggies in a Maker’s Mark brown butter gravy and topped with crispy tobacco onions. Proceeds benefit the Leukemia and Lymphoma Society. 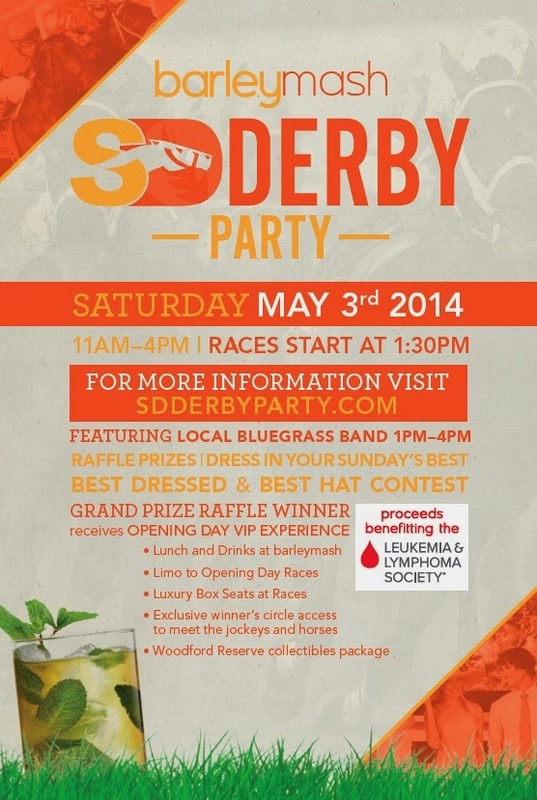 Dress in derby day attire for a chance to win prizes for the best outfit and best hat. barleymash is located at 600 5th Avenue in the Gaslamp District. Visit sdderbyparty.com for more information.